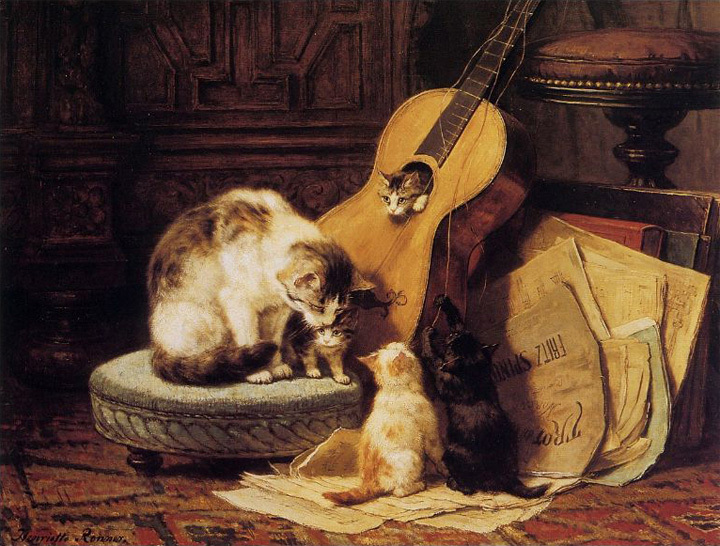 A widely exhibited, highly acclaimed, multi award winning artist known for her paintings of cats and kittens, Henriëtte Knip (» Ronner-Knip » Ronner) worked up until her death in 1909. Collectively acknowledged as the painter of cats above all, she was hugely popular in her lifetime. Extensively collected throughout the 20th and into the 21st century in Europe and in the United States, her works can be seen in museums in Amsterdam; Dordrecht; Haarlem; Rotterdam; Avignon; Dijon; Brussels; London (Royal Collection); other UK and in the USA. Henriëtte, 3rd generation artist, known for her paintings of animals and farmyard scenes, born Henriëtte Knip, Amsterdam 31st May 1821, married Ronner (m. 1850). Henriëtte had earlier shown a talent at only five years old, later studying with her father from the age of eleven, selling her first painting at fifteen and exhibiting in Düsseldorf at sixteen. Signing her early work 'H Knip', likely because her aunt (Henriëtte Geertruida Knip) was an established artist in her own right, she first exhibited at the Hague, Amsterdam in 1838, then in Antwerp in 1840. Following the death of her aunt she is known to have signed Henriëtte Knip and she later, after her marriage in 1850, signed Henriëtte Ronner-Knip. 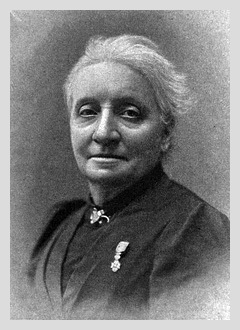 Much later in the 1880s (after the death of her husband Feico Ronner (d. 1883)) and 1890s with daughter Alice, she exhibited as Henriëtte Ronner. Interesting perhaps that the Rijks Museum in Amsterdam have attributed 'early' works dated 1844 signed 'Henriëtte Knip' to 'Henriëtte Ronner', as she was ultimately known, again perhaps because her aunt (d. 1842) had also signed her works Henriëtte Knip. "Art as well as science is being highly subdivided, when an artist finds it worthwhile to live for painting cats. This Madame Ronner has done for the last twenty years, deserting for them her former subject, the dog, a change which the writer of this monograph attributes, in part at least, to the want of grace in the Belgian dog. As to the merits of the pictures, opinion will probably differ. That they are very pretty indeed, no one will deny; but it will be said that they are too highly idealised, and that something of human expression has been given them. On the other hand, enthusiasts for the cat, and there are such, will say that nothing can be too beautiful or too full of expression for the animal, and certainly the grace of its attitudes cannot be exaggerated." Source: The Spectator, December 1891. The above extract from 'The Spectator' and opinion generally clearly records that Henriëtte switched her allegiance from Dogs to Cats in 1870 or there about. Perhaps, but there is no doubt that she had a fondness for cats from an early age as the above painting, circa 1836, clearly shows; one of her twelve prized works, reproduced, the very subjects of the book (MH Spielmann (Marion Harry (Cassell and Co.)). 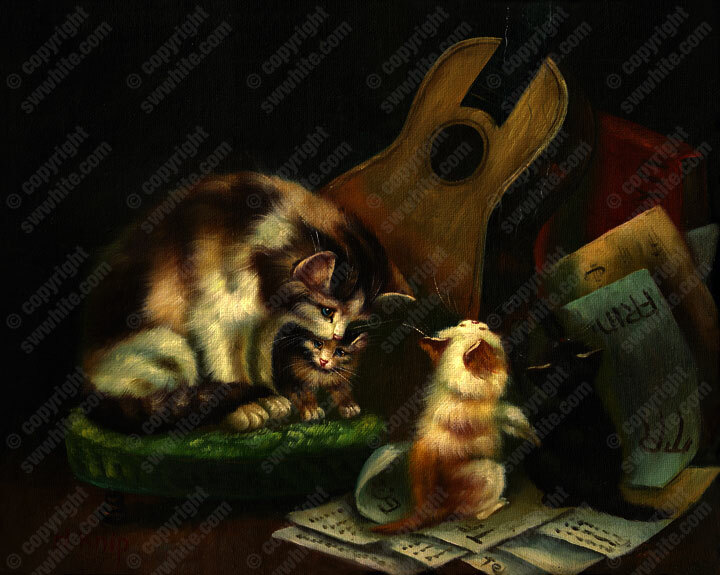 The above later painting of 'Chamber Music' was printed in a publication 'The Illustrated Sporting and Dramatic News', March 1882, and included again in the book 'The Painter of Cat Life and Cat Character'. 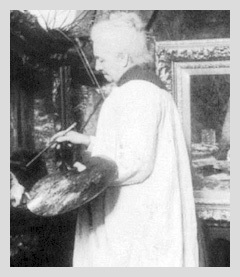 Note that the painting, digital image above, is signed 'Henriëtte Ronner', that it's thought that she didn't sign her works 'Ronner' until after the death of her husband in 1883. This would suggest that the painting itself was signed much later, prior to an exhibition perhaps. Exhibitions after her husband died include: 1886 Rotterdam; 1890 London; 1892 London; 1894 Antwerp with daughter Alice; 1898 Rotterdam again with daughter Alice. 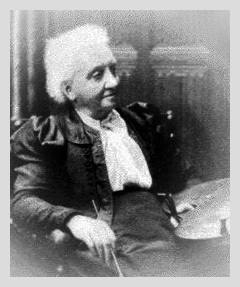 Mother: Merited French artist, Antoinette Pauline Jacqueline Knip born Rifer De Courcelles (1781-1851). Father: Merited Dutch artist, Joseph August Knip (Josephus Augustus Knip (1777-1847)). Aunt: Merited Dutch artist, Henriëtte Geertruida Knip (1783-1842). Grandfather: Dutch decorative artist, Nicolaas Frederik Knip (1741–1808). Children (Artists): Alfred (1852-1901 (Painter)); Mathilde (1856-1946 (Applied Arts)); Alice (1857-1957 (Still Life)); Emma (1860-1936 (Painter)). 2005, Bonham's, London. Banjo and his brother, 31 x 46cm. (12¼ x 18in.). Oil on panel '91. Sold £45.600.00. 2006, Bonham's, London. Three kittens, 18.5 x 22.5cm. (7¼ x 8¾in.). Oil on paper '96. Est. £8,000.00-£12,000.00. 2006, Bonham's, London. Two kittens, 18 x 23cm. (7 x 9in.). Oil on paper '96. Sold £8,400.00. 2006, Bonham's, London. Waiting for a meal, 121 x 96cm. (47½ x 37¾in.). Oil on canvas. Sold £34.074.00. 2009, Bonham's, London. Remembrance of happy days, 37.5 x 46cm. Oil on panel '01. Sold £30.000.00. 2013, Bonham's, London. A cat and her kittens at play, 72.5 x 90cm. Oil on canvas '89. Sold £30,000.00. 2014, Bonham's, London. Give us joy, 24 x 31cm. Watercolour '95. Est. £1,000.00-£1,500.00. 2014, Bonham's, London. Two kittens on a pillow, 21 x 17cm. Oil on panel. Sold £22,500.00. 2012, Christies, New York. A mother cat and her kitten with… 35½ x 28½ in. Oil on canvas '97. Sold $146,500.00. 2013, Christies, New York. A study of kittens, 12¾ x 15¾ in. Oil on panel '99. Sold $81,250.00 (€62,505.63).